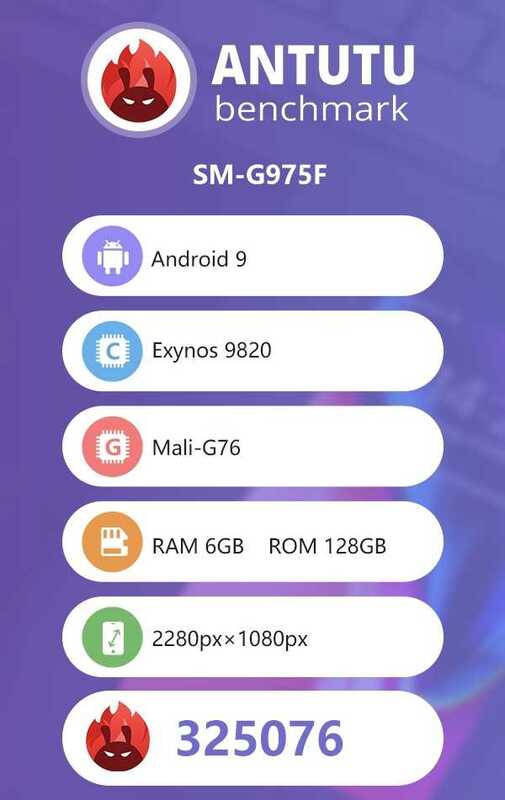 Samsung Galaxy S10 Plus (SM-G975F), the device codenamed “Beyond 2”, has appeared in AnTuTu benchmark with a score of 325076. Unsurprisingly, Galaxy S10 Plus has the highest score (325076) among all Android devices tested so far with the next best being Huawei Mate 20, Mate 20 Pro and Mate 20X which score more than 300K in AnTuTu. Galaxy S10 Plus is powered by Exynos 9820 processor which has a super fast clock speed of 2.7 GHz and Mali-G76 graphics card. Samsung Galaxy S10 Plus has a display size of 6.44 inches and it has a screen resolution of 2280 x 1080 pixels. As expected, the phone will ship with Android Pie OS. The internal storage capacity found in AnTuTu listing suggests it has 128 GB space for storing files and it has 6 GB RAM but there must be a 8 GB variant as well, considering that the ‘Plus’ is the higher variant among the three S10 devices. S10 Plus is expected to have triple rear camera setup and the display is expected to be curved around the edges. With the rumors that the Galaxy S10 range of phones might have anywhere between 3 and 6 cameras, we’ll have to wait to find out which S10 variant has how many rear and front cameras. We believe the S10 plus could have 2 sensors for the front cam and 3 on the back. The recent rumors have confirmed the presence of a 5G edition of Galaxy S10 series which is expected to be launched in March 2019 with a higher pricing than the regular S10 series phones. This phone is believed to be coming with a whooping 1 TB internal storage and 128 GB RAM. This is the top end variant in the Galaxy S10 range of smartphones and is expected to have as many as 6 cameras and an in-display fingerprint sensor (or a side-mounted one). The pricing of the S10 series of phones is expected to be around $650 to $750.